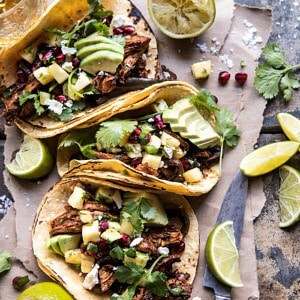 Instant Pot Spicy Pineapple Chicken Tacos. I’m making Thursday Night Tacos a thing, with these Instant Pot Spicy Pineapple Chicken Tacos. 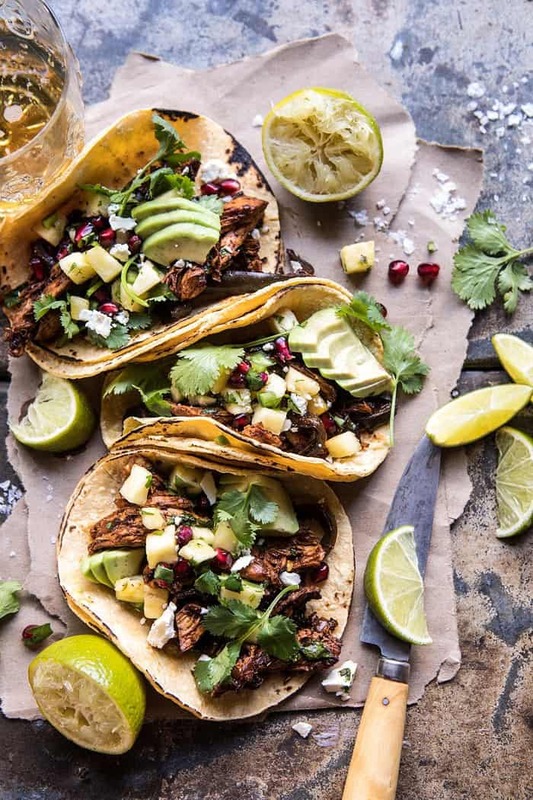 Instant Pot Spicy Pineapple Chicken Tacos from Half Baked Harvest on Vimeo. On Tuesday I shared my favorite Tamale Chili, which I plan to serve up this New Year’s Eve, but it would not be a Mexican New Year’s Eve feast without some tacos. 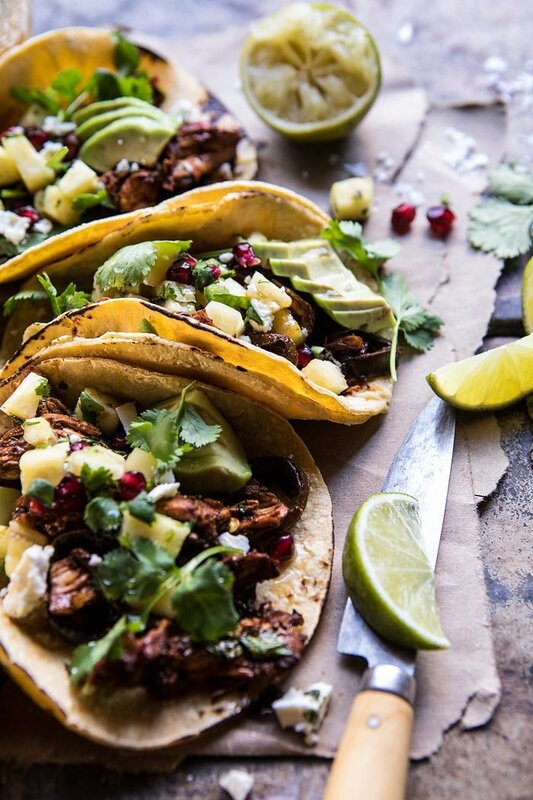 Enter these sweet and spicy pineapple chicken tacos. Oh my gosh, they’re my favorite. With pomegranate pineapple salsa…of course. Because I am obsessed with all the in season winter fruits (as you will soon find out in all the upcoming healthy January recipes). 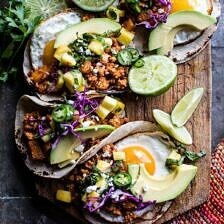 Oh these tacos, they are easy, healthy, and delicious. Throw everything in the crockpot, go out and do something fun, and come home to dinner! I know I’ve said this over and over, but we always do a ton of Mexican over the holidays. Knowing that I would be in need of some super easy and quick dinners while all my family is in town, I turned to slow cooker and instant pot recipes. Tacos are probably one of the most loved foods among the crew, so again, Mexican was also an obvious choice. These are kind of a knock off of an al paster style taco. I swapped the pork for chicken, and cooked everything in the instant pot (also have made in the slow cooker) and added a pomegranate pineapple salsa, which, if I’m being completely honest, is my favorite part of the whole meal. All I really need are tortillas and salsa and I’m good. I love using chicken in place of pork because it’s a little leaner and my family usually prefers it over pork. I also incorporated some poblano peppers for a little smoky flavor and extra vegetables. I haven’t shared these tacos with the family yet, but I’m hoping to make them for New Year’s Eve on Sunday. Feeling pretty confident they’re going to love them, seeing as they contain all of their favorites. Speaking of the family, I feel like I need to catch you guys up on our family Christmas. Winter finally arrived, just in time for Christmas, and we spent most of Christmas Eve and Christmas Day outside playing in the backyard. Well, let me rephrase that, all of the boys spent most of Christmas outside, while the girls and I cooked and made more cocktails than I could ever count. Christmas Eve was actually pretty mellow as we headed to a friend’s house for a party that night. I was still in the kitchen all day, but just ended up making a giant pot of my brother’s favorite gumbo, beer bread from the cookbook, this blue cheese appetizer, these brie rolls, and a GIANT batch of chex mix. Christmas morning we woke up to a very white Christmas with about three feet or so of snow. It was pretty much what you see in the movies, and it was perfect. We spent the morning opening gifts, unpacking our stockings, and eating monkey bread. Even though most of us kids are all grown adults, my mom continues to make Christmas the BEST every single year. Giving her a HUGE shout out for not only making all seven of her kids Christmas amazing, but also my three cousins who spend Christmas with us every single year. She also shopped for four girlfriends and one boyfriend, making her grand total of people to gift for at fifteen. And that does not include my dad, because he’s literally the Grinch and hates Christmas…wish I was joking, but it’s the honest truth, at least he goes along with it though. Once gifts had been opened most everyone made their way outside and then eventually back to my house for a lunch of grilled cheese, leftover gumbo, leftover tamale chili, and um yes, more cocktails. For dinner, I unexpectedly found out (at like 5 o’Clock) that I’d be cooking for not only my family, but also my brother’s girlfriend’s family, and my brother’s friend’s family, making a grand total of twenty-seven people. The more the merrier, right? Yup, my mom has ingrained this into me. I ended up making the simplest dinner of beef tenderloin, cheesy potatoes, pasta dish from the cookbook, a giant lasagna, and a giant salad. And then, I made my brother Red homemade sushi, because one, he’s been requesting it for over a month, and two, this was the only day I actually had time to make sushi. It’s turned out OK, but my sushi skills could definitely use some sharpening. SIDE NOTE: I made the sushi before I knew about all the extra people coming for dinner, so Red’s lucky it actually happened. And that’s our Gerard family Christmas! The family has been spending these days after Christmas, and leading up to New Years, playing outside. They’ve been hiking, snowboarding, snowmobiling, and just playing in the backyard. I’ve been mixing in work with a little chill family time too, so it’s been nice. Still cooking a ton, but what’s new there? 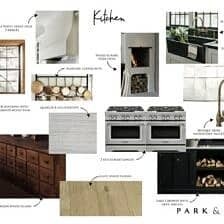 And now that I’ve written a story book about our family Christmas, I think we should all head to the kitchen and start cooking dinner, because Taco Thursday is sounding pretty delicious right about now. These are kind of a knock off of an al paster style taco. I just swapped the pork for chicken, and added a delicious pomegranate pineapple salsa. 1. In the bowl of your instant pot, combine the chicken, onion, garlic, chili powder, paprika, cumin, salt, chipotle chile peppers, pineapple juice, pineapple, and poblano pepper. Cover and cook on high pressure/manual for 20-25 minutes. Once done cooking, use the natural or quick release function and release the steam. Shred the chicken using two forks. 2. To make the salsa, in a bowl, combine the pineapple, pomegranate arils, jalapeño, cilantro, lime juice, and a pinch of salt. 3. Stuff the chicken into the warmed taco shells and top with pineapple salsa, cheese, and avocado. Enjoy! 1. 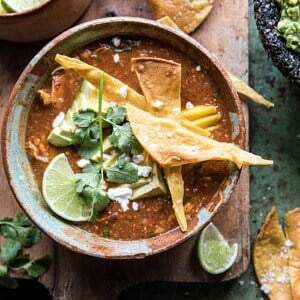 In the bowl of your crockpot, combine the chicken, onion, garlic, chili powder, paprika, cumin, salt, chipotle chile peppers, pineapple juice, pineapple, and poblano pepper. Cover and cook on LOW for 6-7 hours or on HIGH for 4-6 hours. Once the chicken is done cooking, shred with two forks. Finish as directed above. PS. don’t forget a side of guacamole, chips, and margaritas. DUH. My 35 Favorite Healthy Recipes for the New Year. Slow Cooker Chipotle Chicken Tamale Chili. Aww, sorry about your dad not liking Christmas; but hooray for YOU loving Christmas and for all the quality family time. Your Christmas sounds like it was lovely! I grew up in Montreal, but live in the UK now and I have to say that the thing I miss the most is the snow! So I’m a bit jealous of all your white stuff. But these tacos will make me feel better. YES! 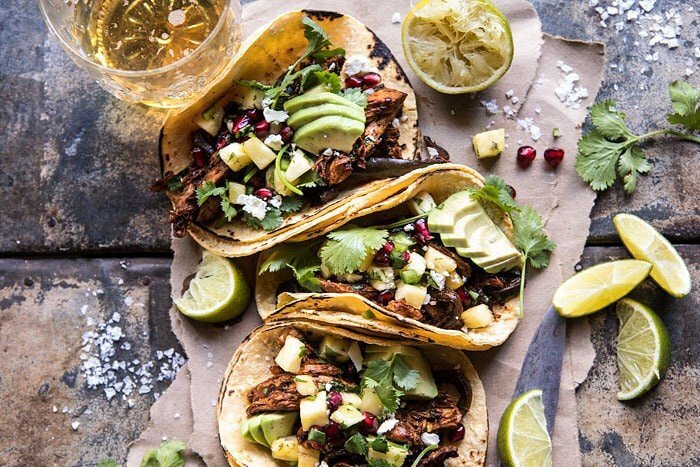 Tacos make everything better right?! Haha. I hope you love these Debs, thank you! This looks simply fabulous. So so good as usual. So nice to hear you having a great Christmas, especially white Christmas. Have a beautiful weekend!! For all of us who lives in Denmark and do not have a pressure cooker, is there any way to make this in a normal pan/pot/oven? 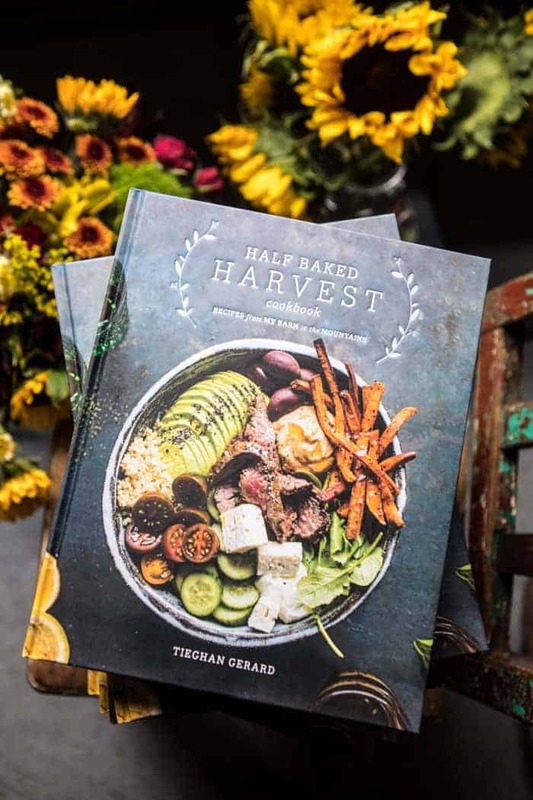 LOVE your cookbook and recipies!! Preheat the oven to 400 degrees F. In a greashed 9 x13 inch baking dish, combine the 2 tablespoons olive oil, the chicken, onion, garlic, chili powder, paprika, cumin, salt, chipotle chile peppers, pineapple juice, pineapple, and poblano pepper. Transfer to the oven and roast for 20-25 minutes or until the chicken is cooked through. Shred the chicken using two forks. I like these tacos and the addition of the salsa. I made my mom your tamale chili tonight and she seemed to enjoy it! Maybe it would have been good with some frozen corn or cojita cheese? 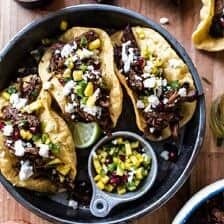 I love the simple crockpot recipes (like these tacos 😉) and think they’re perfect for this time of year. I’m glad you had such a wonderful Christmas and are able to hangout with everyone! Haha that’s a lot of people and I was nodding when you mentioned making the sushi (and it happening before hearing about the additional guests 😅). Hi Kristin! Thanks, so glad you like these! I love having my whole family here, and am so happy they were able to make it! Almost everyone is still here except for a few of my cousins.. totally wish they could have stayed! Thank you and Happy New Year!! Wishing you a very Happy & Healthy 2018! I am so glad you enjoyed these and other recipes on the blog! Thank you Eileen and Happy New Year! Just discovered your blog through Brown-Eyed Baker. So pleased to have found it because your recipes look fantastic. Thanks! Thank you Cindy! 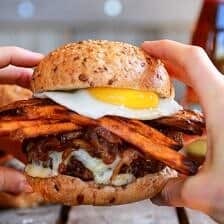 I hope you love the recipes on my blog! 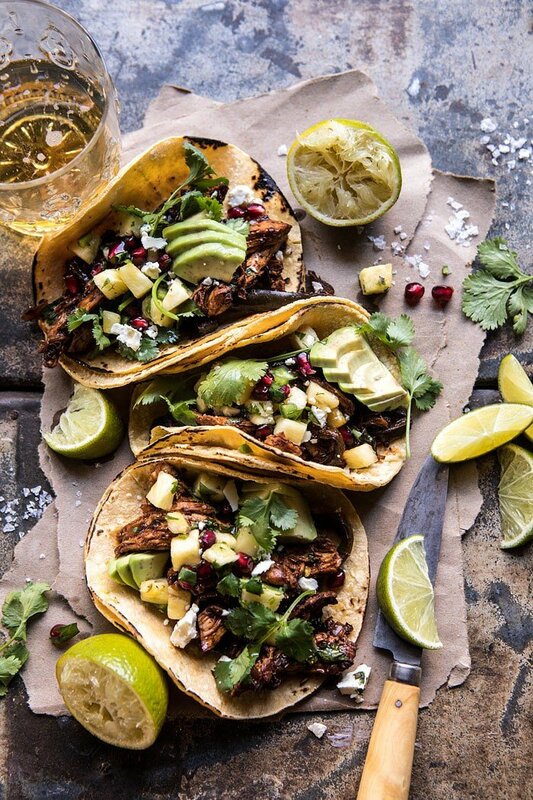 These tacos are just what my Tuesday night needs! YES! I hope you love these Laura! I just made this tonight and oh man, the salsa MAKES the dish! The chicken was nice and moist, but did not have the depth of flavor I had hoped for, nor the pretty caramelized color like the photos, but that may be my own fault for leaving out the poblano. I will make this again for sure because the whole package of the chicken, salsa and avocado was so delicious, fresh and healthy. I am so glad you liked this Laura! Thank you! Another hit! I kicked it up with cayenne pepper to give it a little more heat. What tortillas do you use? I always have the problem where mine will rip – your look perfect! Can you use boneless skinless chicken thighs? This was soooo good! And the salsa was perfect!! Definitely worth the couple minutes it takes to make it! Thanks for sharing a great recipe!! Do you reserve the veggies, pineapple, etc or do you discard? 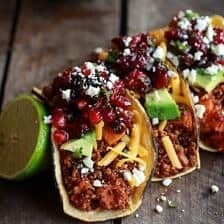 Do you add all the other goodies in the instant pot to the tacos as well or are they just there to give the chicken flavor? 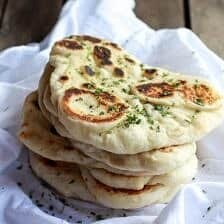 Loving your blog and recipes! What could I substitute for the pomegranate? I have not been able to find them anywhere. Hi, great video. Saw you added water to the instant pot but in the recipe you don’t list it or mention how much? Is water critical? 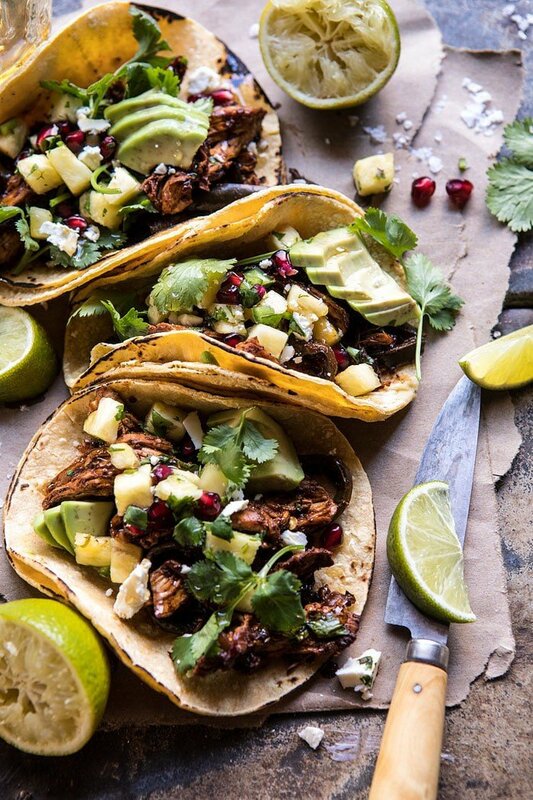 These tacos sound delicious! 2 pounds of chicken is way too much for just my fiancé and I – if I were to cut the recipe in half, should I keep the amount of pineapple juice the same, when using the instant pot? 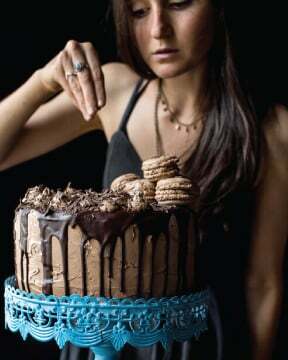 Excited to make these this weekend! Will the salsa hold if made in advance? And do you think these turn out better in the instant pot vs the crock pot? I have both so just wondering! Can you use frozen chicken breasts instead? If so, how would that affect the timing? I made these tonight for dinner and the texture of the chicken was perfect! Your cooking directions were spot on! My chicken and sauce were more of a pale color compared to your photos. I ended up thickening the sauce slightly with a little cornstarch too. Next time I’d add twice the seasonings/chipotle/pineapple but will definitely make it again! Thank you so much Ashley! I am so glad you loved these tacos! These are so very good!! I made a few adjustments based on what I had on hand, (but nothing major). The biggest addition I made was to add red onion to the salsa. I am so glad you loved these tacos Penny! Thank you! If I’m making for a party and want to double the recipe, do I need to increase the time in my pressure cooker at all? Looks delicious – can’t wait to try! Love love loved it! Thanks so much Tieghan. 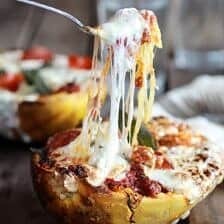 I’m going to make these but can’t handle much heat from peppers. Should I just omit the chipotles? Maybe only do 1/2 of one? Use a small amount of chipotle powder instead of the ones in adobo sauce? 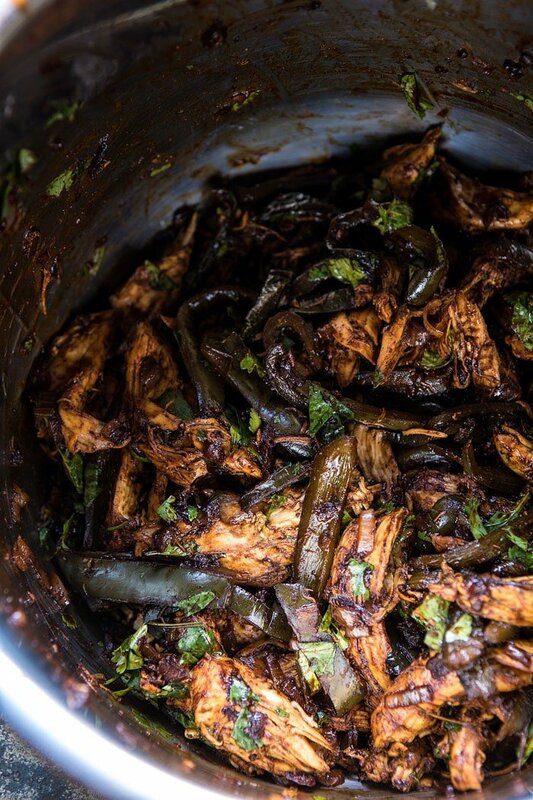 I’m good with the poblanos as they don’t really have heat but the Chipotle’s typically set my mouth on fire! Any ideas to tone it down are appreciated!